Just because summer is over doesn’t mean your love affair with salads has to end. With fall in full swing and winter drawing nearer it is time to embrace deep evergreens, blood red, and crisp autumn yellow colors – in our food that is (not just our wardrobe). Try this delicious collard green salad to titillate your taste buds. Prepare collards as directed and place in a large bowl. Drizzle with 1–2 teaspoons olive oil and sprinkle with salt. Massage greens with your hands, kneading and squeezing until they begin to wilt and become soft. Set aside. Add vinegar, remaining olive oil, and salt and pepper to a mason jar. Secure the lid and shake until well combined. Season with additional salt and pepper to taste. Add dressing to salad, just enough to coat the ingredients. 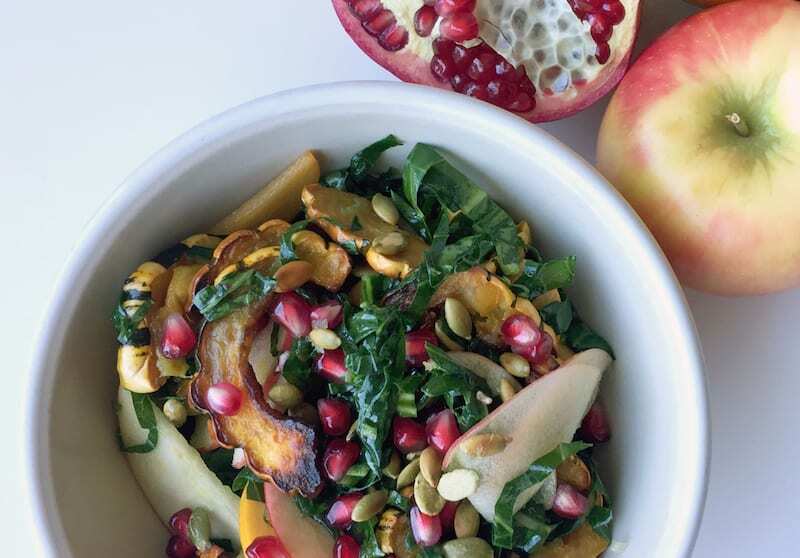 Toss in squash, pumpkin seeds, persimmon, apple, and pomegranate seeds. Serve and enjoy! If you’re interested in all things health, nutrition, and taste related then check out the Nutrition Programs at Bauman College, or call 1-800-987-7530.